Marvel Two-in-One #51: Full House -- Dragons High! Inside? Nope. But check out that cover! In 2010, this was voted as number 10 / 11 in the "Greatest Thing (Ben Grimm) Stories Ever Told!" poll at Comic Book Resources. 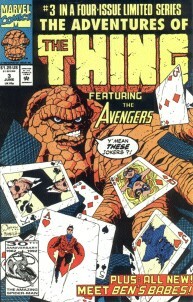 This issue was reprinted in 1992 in Adventures of the Thing #3, part of a four isue miniseries of MTIO reprints. There's a somewhat nice follow-up to this issue, written by Chris Claremont, which is the back-up story in Marvel Fanfare #24 (cover-dated January, 1986). It has exactly the same group of poker players, but set a few years later, after Ms. Marvel had lost her powers and then been genetically altered by the alien race known as the Brood, becoming Binary. That issue is mostly about Binary/Ms. Marvel, who learns here that the original Captain Marvel has died of cancer. The poker game also makes another appearance in MTIO 76.